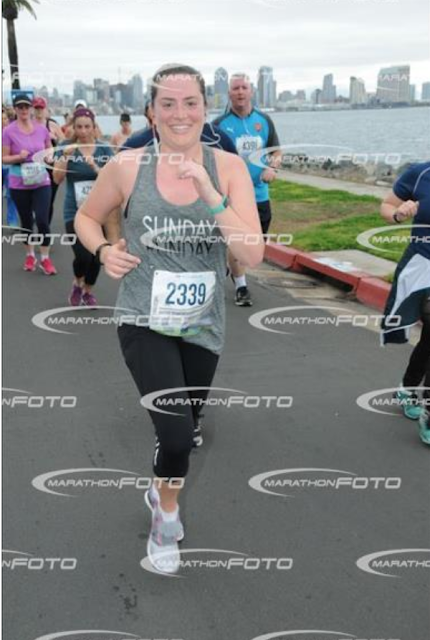 A while back, my roommate Alison asked me if I would run the San Diego Half Marathon with her. It sounded like a fun challenge, so I said sure and signed up! What a journey! Un po' di tempo fa', la mia roommate Alison mi ha chiesto se volevo fare la mezza maratona a marzo on lei. Mi sembrava una buona idea, allora ho detto di si e mi sono registrata subito. Luckily, living in San Diego, I get some pretty gorgeous runs in. My brother gave me these headphones for Christmas and I love them! I've even been using them on flights because they are small and work really well. Per fortuna, abitando a San Diego, tutti i posti in cui corro, sono molto belli. Simone mi ha regalato delle cuffie per natale e le godo molto. Le sto usando anche quando volo perche' sono piccole e funzionano bene. Before the race, they have the Expo where you pick everything up. They have this fun San Diego logo that you could sign. Prima della corsa, hanno un evento dove vai a prendere tutto. Avevano questo logo di San Diego che potevi firmare. Race day was intense! Not only was I nervous for the race, but it was also Daylight Savings! We woke up early and ubered down to PetCo. It was perfect running temperatures the entire time. 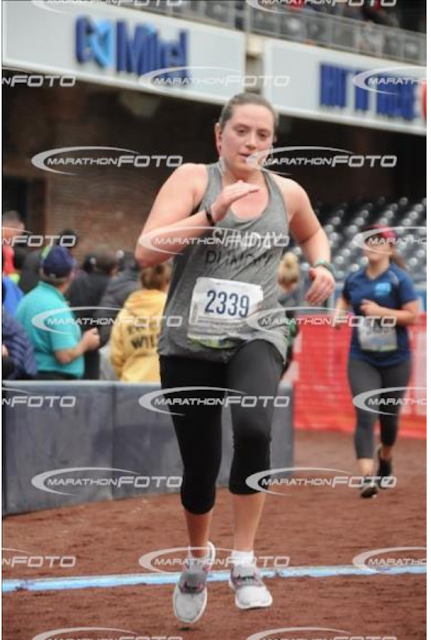 The race was tough, but I felt pretty good throughout. I beat my goal of 3 hours and ran a lot more than I was expecting. Il giorno della gara era molto intensa! Ero abbastanza nervosa per la corsa, ma l'ora era appena cambiata. Ci siamo svegliati presto e siamo andati giu'. La temperatura era perfetta. La gara era difficile, pero, volevo finire in meno di 3 ore, e ho finito in 2 ore e 33 minuti. Ero molto contenta del mio tempo e con il fatto che ho corso piu' di quello che mi aspettavo. The finish was inside PetCo park which was AWESOME! My parents were in town, along with Valentina, and Christina came down to watch the race as well. It was an amazing feeling running inside the stadium and seeing them there cheering me on. L'ultimo pezzo era dentro il parco di baseball. I miei erano appena arrivati con la Valentina, e la mia amica Christina era venuta giu' per fare il tifo. Era proprio bello entrare e vedere tutti li per me. My friend Tayler is a rockstar! She finished in under 2 hours. She is running the Boston marathon on April 16. Click here to support her! So happy they were in town! All os us awesome finishers! Can't wait for the next one!